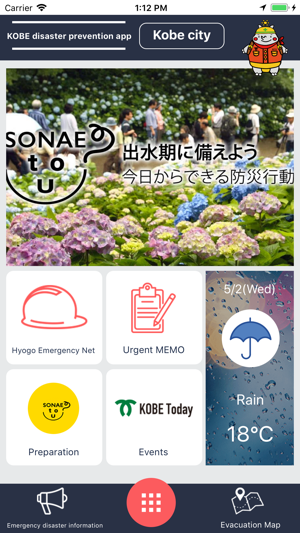 This is a disaster prevention app featured with disaster prevention information including hazard maps, evacuation facilities, urgent MEMO function as usually disaster prevention measure. *In addition, since the tsunami possible inundation area on the hazard map is assumed, in regard to the actual evacuation behavior, please check the disaster situation, based on evacuation information of the administration and your own judgment. 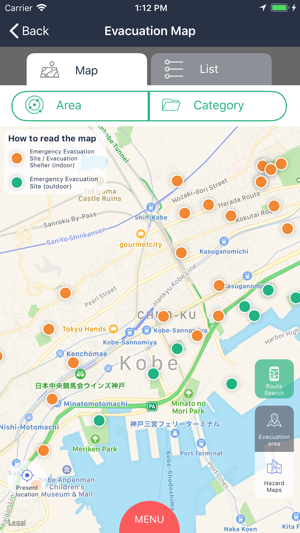 "Hazard map which check the Hazard zone, designated disaster evacuation site and evacuation shelter in Kobe, it can use even in case of your phone cannot be connected (when data communication offline). And Show your location on the map by GPS. It’s an aim to make sure of hazard map. (*Please note that GPS accuracy is depending on environment, positional deviation will happen in actual use, and can’t get the location data depending on the weather and geography.)" Also, a walk route search to the facility in normal times. Furthermore, provides disaster information by push notifications by collaborating with "Hyogo Emergency Net". Make notes of the necessary information in the app during a disaster. You can check contact number of your family members, evacuation site and checklist of things to bring in case of emergency on the app. About the data which provided in this app, we ensure the display contents, but it’s not guaranteed completeness. Please judge yourself about accuracy, reliability, safety and utility of the data. And we assume no responsibility whatever for any damages based on the use of this app. Just after start the app, display the today's weather and temperature. And you will see the Preparation, Event information, Notification, Urgent MEMO, Emergency disaster information, Evacuation Map. The Menu appears to tap MENU button the bottom center of screen. You can see the contents you want directly. Introduces advance preparation for taking accurate action when a disaster occurred. Check notification that offered by this app. Notification will be update at any time. Posts useful notes in an emergency. Checklists appears in "Things that always hold", "Things to bring when temporary evacuation" and "Helpful things that for long term living in shelters". Just tap to check. Register information about your family and you by tapping sign up from "Information about my family and I". Take notes of evacuation sites for landslide disasters, floods, and tsunamis in the "evacuation site when a disaster occurred". Distributes urgent information when a disaster occurred. Check evacuation facilities on the map. Choose items from "Area" and "Category". Choose "Area", displays the selected area. Choose "Category", displays facilities of selected category. Tap "List", displays evacuation facilities in order from closest to the current location. Tap symbols on the map, displays facility's name. Tap "Go this point", displays the route from current location. Tap "Route search" the bottom right of screen, Set and search by starting point and your destination. Open the menu at the bottom center of screen and tap "select area" to open the area selection screen like the image. The selected area is reflected in the initial position of weather/map on main page.